Would this tattoo prevent him from getting a Job? After a recent Sean Says email about whether getting a tattoo on your neck could hurt your chances of getting you a job, comes this story….and no he doesn’t need to worry about getting a job. Well, maybe if he wants to work in the kitchen in the clink. 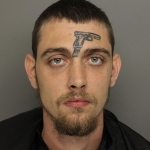 24-year-old convicted felon Michael Vines crashed his Toyota Camry into a pole in Greenville, South Carolina on Saturday. 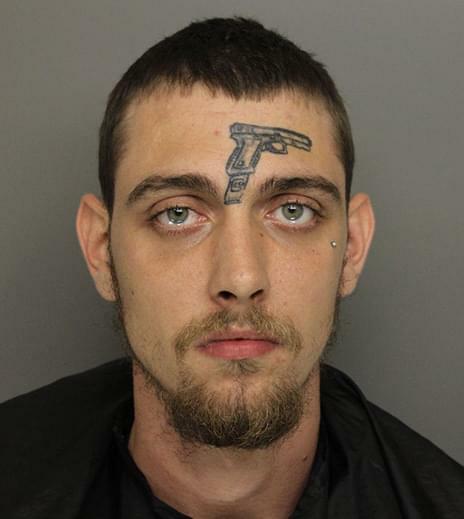 If you’re a felon, you’re not allowed to have guns, except for the one tattooed on your forehead. But when firefighters on the scene told the cops they might’ve seen Michael toss a gun into the grass, the police did a thorough search . . . and found his loaded .38. Michael was charged with illegal weapons possession, reckless driving, and driving with a suspended license. At least he isn’t guilty of false advertising!